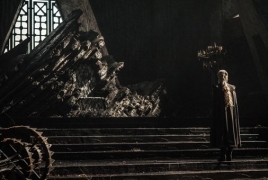 PanARMENIAN.Net - "Game of Thrones" fans have spotted a fascinating link between Sansa Stark and Daenerys Targaryen which suggests why they make such great leaders and could lead to an exciting encounter between the pair in season eight, Express reports. "Game of Thrones" is one of the very few shows out there to feature strong female leads with characters such as Sansa Stark (played by Sophie Turner), Daenerys Targaryen (Emilia Clarke) and Cersei Lannister (Lena Headey) all looking to play significant roles in season eight. However, despite two of these characters never actually meeting, an eagle-eyed viewer has spotted a connection between Sansa and Daenerys. The "Game of Thrones" fan spotted that the two characters went from being controlled by male characters, who they learnt from and then discarded. “Season two finale, Dany talking to Xaro Xhoan Daxos before locking him away,” began rnplzhlp on Reddit. "Thank you, Xaro Xhoan Daxos. Thank you for teaching me this lesson." The user continued: “Season seven finale, Sansa talking to Littlefinger before ordering his execution. "Thank you for all your many lessons Lord Baelish." “Like I said, minor connection. Both girls brought down the men that promised them the world,” the user finished. Season seven saw Cersei and Daenerys finally meet one another, which was a meeting fans were desperate to witness and they weren’t disappointed. Daenerys came to King’s Landing with Jon Snow (Kit Harrington) in tow. The pair of them brought Cersei a White Walker and explained to her the threat they and their leader, the Night King (Vladimir Furdik), posed to Westeros. The connection the Reddit user spotted is fascinating since it shows a common theme in the show. "Game of Thrones" features many female characters who have all grown over time into formidable leaders. Sansa and Daenerys, in particular, have had to learn quickly and didn’t really have that ruthless streak that Cersei had. However, they couldn’t do this on their own. Both characters had to learn as much as they could from people, no matter how displaceable they were. This was certainly the case with Sansa and Lord Baelish (Aidan Gillen), who was an awful human being, yet was very clever and a master manipulator. If Sansa wanted to become a true leader, she’d need to learn some of his tricks, which she has done. Express. Game of Thrones season 8 spoilers: Sansa Stark’s link to Daenerys Targaryen revealed?